The SG Commander is a third-party control pad released in 1988 by Hori in Japan. It was made to be compatible with all of Sega's 8-bit game consoles available at the time (such as SG-1000, SG-1000 II, Sega Mark III), hence the "SG" naming. 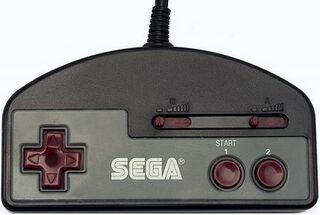 A first-party variation was later released for the European market by Sega, where it was sold strictly as a Sega Master System peripheral with no mention of compatibility with previous Sega platforms. Aside from the different logo on the casing, the Hori and Sega versions of the SG Commander are functionally identical. The controller has the same form factor and model number as the original Hori Commander for the Famicom and the later PC Commander for PC Engine. The SG Commander closely resembles the standard Famicom controller with its cross-shaped directional pad and rectangular form, although the top portion of the controller is curved. It has two sliders for adjustable turbo fire for each action button.